When it comes to men’s rings, long lasting, durable and maintenance free tungsten rings are the clear choice. Second only to diamonds in hardness, tungsten rings are cut and polished using the same tools reserved for the hardest precious stones. Men wear tungsten rings for their classy finish, their durability and their long lasting design. Whether you are on a business trip, or changing the oil on your car, a tungsten ring is the perfect accessory for class, comfort and dependability. Due to their extreme hardness and fine, scratch proof polish, tungsten rings are maintenance free and last longer than silver, gold, titanium or nickel, keeping a peerless and untarnished finish that will last a lifetime. Tungsten rings make great wedding bands for men, as well. Tungsten requires minimal cleaning and maintenance, will last a lifetime and retains a luxurious polish. 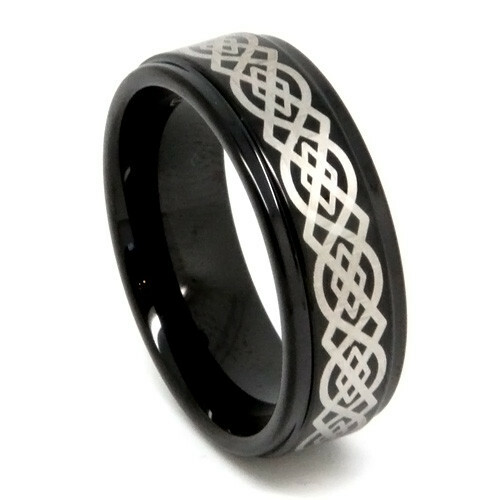 Tungsten rings come in several different styles and colors, including black. If you choose a polished finish for your tungsten ring, any blemishes or small scratches that appear on it can easily be eliminated with soft cloth. Because of their extreme hardness (tungsten carbide scores between 8 and 9 on on the Mohs hardness scale), tungsten rings can sometimes cause other metals they come in contact with to become embedded in them. Simply buff the irregularity away, and you are good to go. They retain their finish for a lifetime. Tungsten rings hold their exact shape throughout the life of the ring. Tungsten rings are hypoallergenic, causing no skin irritation. They are classy rings that communicate strength and luxury. Tungsten rings are denser than both steel and titanium, giving them a satisfying weight and strength. You will find that they are virtually impossible to scratch or scuff due to their extreme hardness. From the moment you wear a tungsten ring on your finger, you will feel the incredible satisfaction that comes along with owning one of the finest crafted rings in the world.